30-minute class teaching beginner and intermediate exercises that isolate specific areas of the spine individually and work the spine in 3 dimensions to regain full range of motion and function. With improved function, the exercises taught will integrate individual parts of the back into whole body movement. 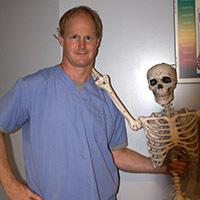 Taught by Dr. Brian McMaster, The Chiropractic Center at MAC.